Anyone who runs a modded Harley will know Biltwell Inc. The Californian company is a big player in the upgrade market, and its universal-fit items are even appropriated for new wave metric customs. The guys who run Biltwell have petrol coursing through their veins, and the stable of daily riders in the Temecula parking lot is eclectic. It mostly leans toward Big Twins, but several of the crew have a dirt bike in their quiver. 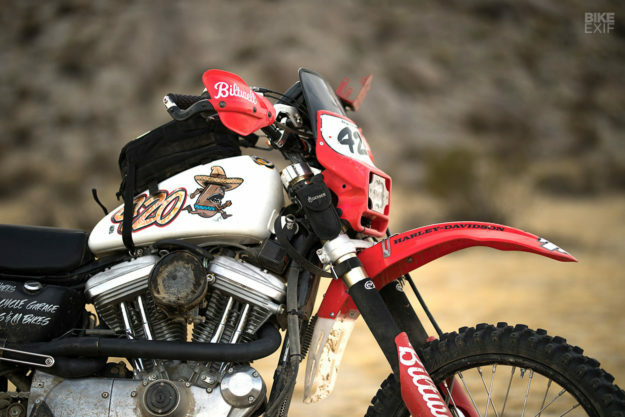 It’s often an XR400 or a TT500—or in the case of main man Bill Bryant, both. To Bill’s amazement, everyone said, Hell yes! 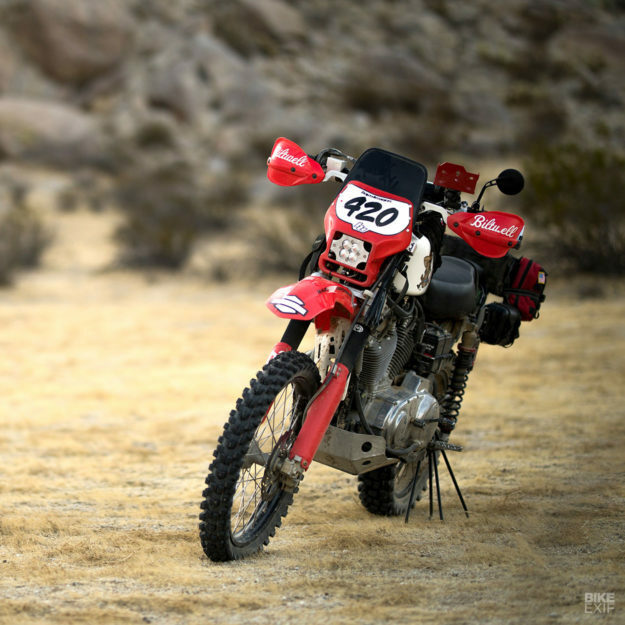 And so we have Frijole (Spanish for ‘Bean’), the world’s most improbable rally raider. 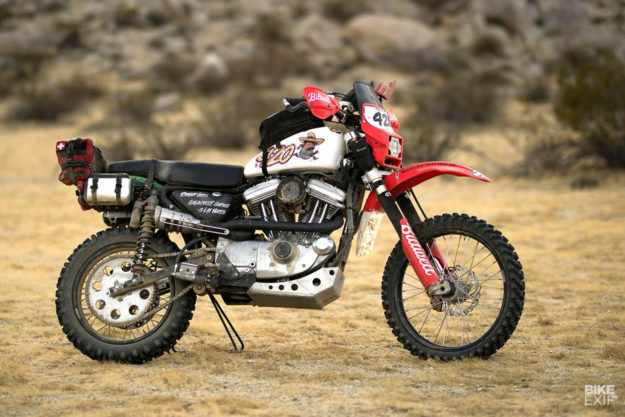 Bill, Rob ‘Rouser’ Galan and a small crew built this Sportster with a single intention: survival. 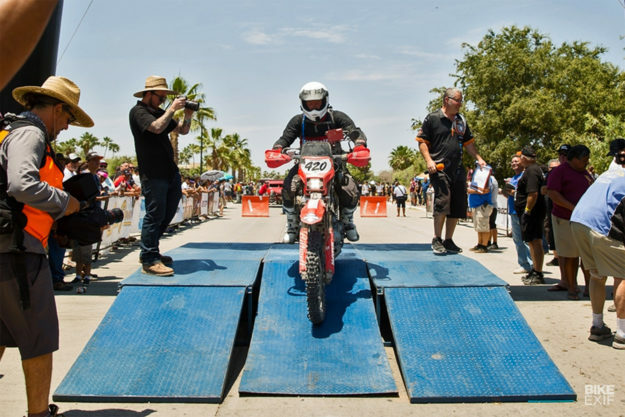 “We knew that the combined 1,300 miles from Ensenada to Cabo would take a toll,” says Bill. 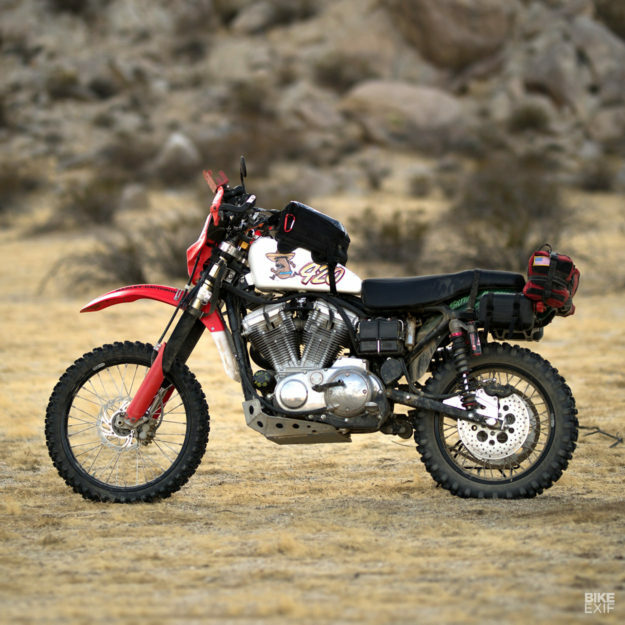 To maintain the essential look of the Sportster, the Biltwell crew had to make some compromises. Frijole’s frame, swingarm, tank and rear fender are all OE spec, and the stock oil tank is heavily fortified rather than replaced. “Wet and unladen, she weighs in at 475 pounds [215 kilos]—50 lighter than stock,” says Bill. 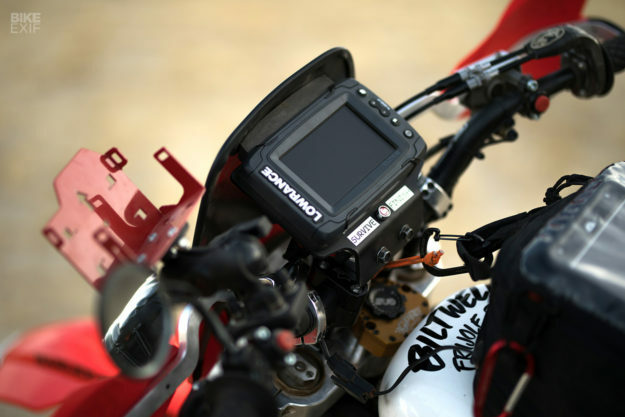 “But on race day, she’s equipped with Lowrance navigation, a backup iPad, a road book, miscellaneous rider aids, safety and recovery equipment, tools, spare parts, extra fuel and EXFIL tank and side bags. 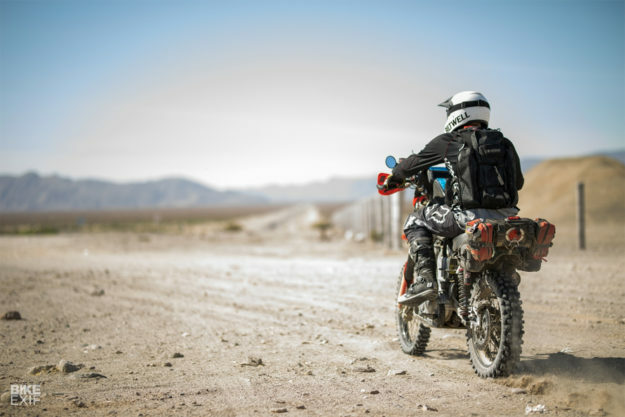 During development and testing, Bill and his crew tried hard to replicate the terrain they’d encounter on Baja’s rugged sand washes and rutted farm roads. 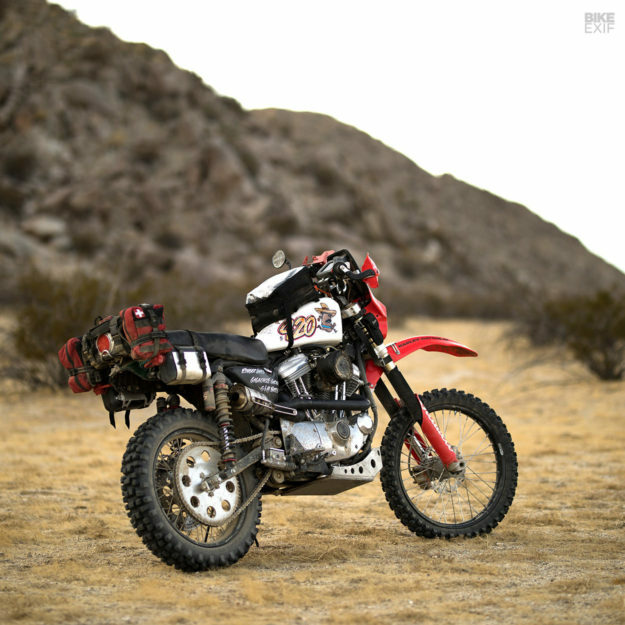 “For such a heavy bike that was never intended for this kind of use, Frijole 883 was surprisingly capable,” says Bill. 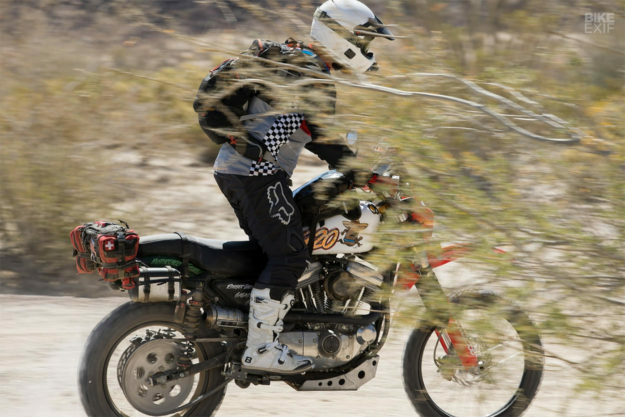 “But we opted for reliability and serviceability over pure performance.” The three other riders on Biltwell’s four-man team agreed to run the Sportster under its threshold, with the goal of just finishing the race. The race prep was smart rather than flashy. 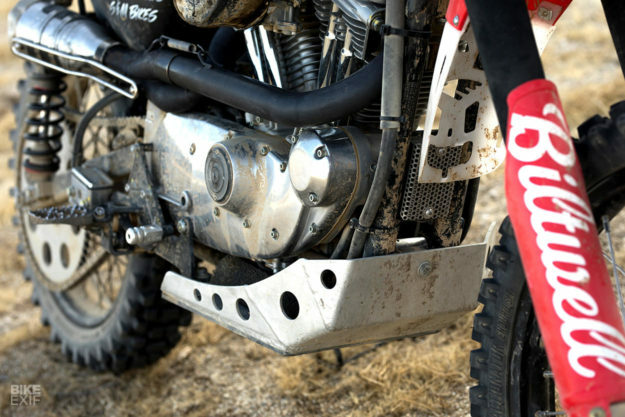 Case in point: in the stock location, a Sportster foot shifter hangs out in the open. So the crew welded an XR400 steel shift lever to a Harley clevis and mounted it backwards, so it shifts GP style—one up, four down. The exhaust is tucked up and inward, as tight as it can be. But hands down everyone’s favorite modification to the Frijole 883 was its Rekluse clutch. Suspension for a bike this short and heavy was a challenge. 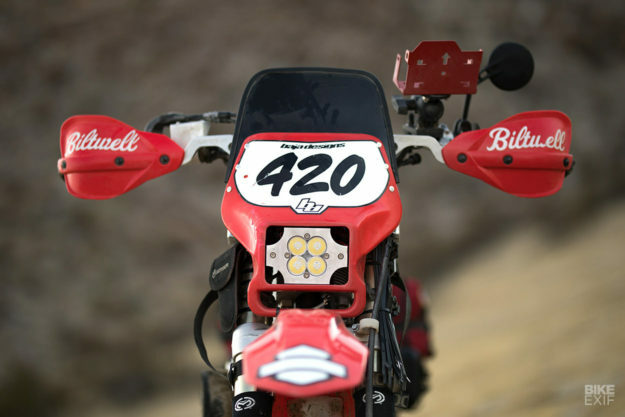 “We went through several variations on the Honda CRF250 front fork until we got it right,” says Bill. 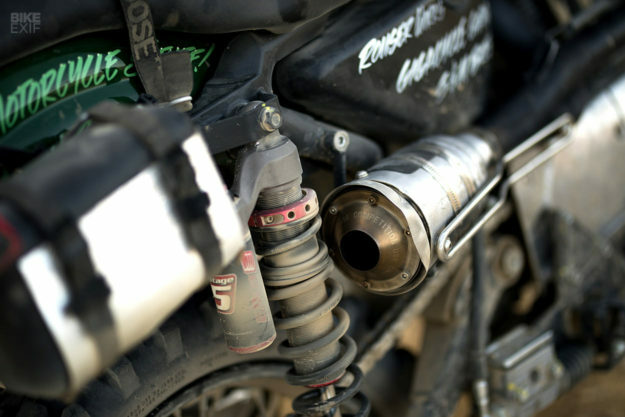 Cannon Racecraft custom wound the springs and Precision Concepts lowered and re-valved the forks to Africa Twin specs. Gigacycle Garage made a custom top tree and steering stem to mate the fork to the stock frame and work with the GPR stabilizer. Out back, SoCal off-road suspension guru Doug Roll gusseted the swingarm, relocated the bottom shock mount and added a double brace. Since the new shock geometry conflicted with Harley’s stock brake bracket, Gigacycle also CNC machined a custom aluminum brake mount to relocate the Tokico 4-pot caliper. 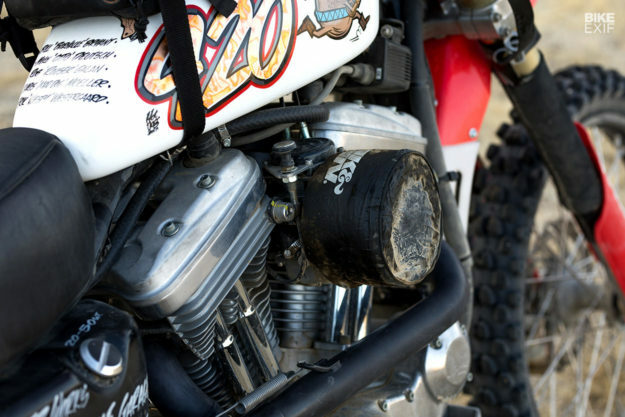 A single set of 17-inch-long Elka Stage-5 shocks lasted the whole race, even the one directly behind the Frijole 883’s custom SuperTrapp exhaust. German-built Huenersdorff fuel cans and modified mounts on each side provided an extra 1.2 gallons of fuel, and on two really long stretches, the crew added a third canister in the EXFIL-11 tank bag. Remarkably, the Frijole 883 made it to the finish. Out of 21 bikes in the Modern Open class, it finished 14th. And all the other Modern Open machines that finished ahead of the Sportster probably weighed under 300 pounds. And that includes us, too. More of this madness, please.